If real-time capable devices have to be connected to a TSN network, the whole real-time path starting in the application running on the device’s real-time operating system (RTOS), down through the TSN stack, the Ethernet device driver to the Ethernet hardware has to be entirely deterministic - both for sending as well as for receiving data. In addition, regular and non-deterministic TCP/IP/Ethernet communication has to be provided on the same Ethernet controller through the TCP/IP stack of the RTOS in a way not to disturb real-time traffic. High precision clock synchronization according to 802.1ASrev as well is a key part of the TSN stack. The Ethernet drivers included in the acontis TSN stack are specifically optimized to guarantee the respective processing of high priority time scheduled as well as low priority best effort data (e.g. regular TCP/IP traffic). The TSN stack as well as the included high performance and deterministic Ethernet drivers are based on the long-term field proven combinations of RTOS, processor and Ethernet MAC controllers used in the world leading acontis embedded EtherCAT master stack. 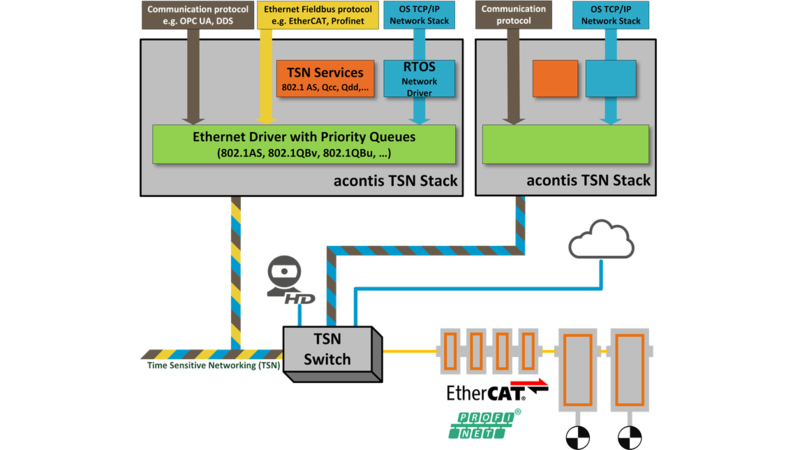 The acontis TSN stack provides a conveniently usable API in terms of which respective protocols (OPC UA, Profinet, EtherCAT, …) may be transmitted via a TSN network. Furthermore, the stack includes a special RTOS specific network driver in order to use the same Ethernet interface for regular TCP/IP traffic, this is done in a way not to disturb parallel transmission of real-time protocols to be carried over TSN. In addition to the RTOS network stack which provides a standard socket interface the TSN stack offers a real-time capable UDP channel; as a result, existing UDP based protocol stacks can easily be adjusted to utilize deterministic data transfer over a TSN network.